The beauty and the charming get-up of Indian Brides are known and celebrated all over the world. People across the globe compare the appeal of the Brides of India to a magnificent dream. The charm and aura of the soon-to-be-Mrs. is complemented with stunning accessories. Be it the necklace, the bangles, the earrings, the mangteeka, or any other accessory, every adornment of the bride has to be perfect. These jewels help her show the best of her feminine beauty on the big day of her life. 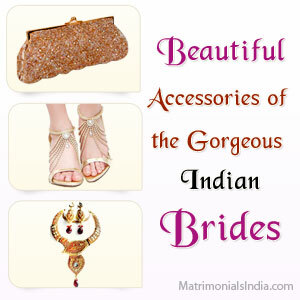 Read on to know what all do the bridal accessories constitute. The Bag - The bride's bag is mostly either a Clutch or a small Potli. At present, the designers or the shopkeepers from whom the wedding dress is purchased offer a matching bag as well. The Footwear - It is interesting that the choice of the length of the heels of the bride's sandals depend on the height of the groom. In India, there are some shops that specialize in offering blingy Bridal Sandals. Indian weddings are known all over the world for being extravagant in all terms. This fact stands true even when it comes to the look of the bride. The families of both- the bride and the groom do their best to make the wedding an enjoyable and memorable experience for the couple. This is one reason that the Bride is gifted wedding ceremony attire and accessories by the groom's family as well. Lovely accessories. Beautiful details. Thanks for posting this helpful post.